The Business DNA free trial is the behaviorally intelligent talent management solution used by business leaders and management consultants to discover the talents, communication styles, and personality profiles of employees and customers. Start learning about how Business DNA Natural Behavior Free uncovers your unique talents and the power of these insights for finding the right role and team fit. Please self-register on the trial link. Additional reports are available during a live feedback session with our behavioral insights experts. 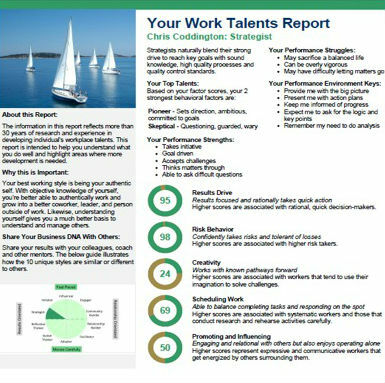 Know your employee’s core talents. Engage customers with interactions catered to their communication style. Grow employee engagement and deepen customer relationships.